The Model 138-LRS Live Roller Spur is used in diverging or converging applications. It may be self-powered or can be slave driven from 138-ACC, LRC, or LRSS conveyors. Overall Frame Widths: 12", 15", 18", 24"
The Model 190-LRS Live Roller Spur is used in diverging or converging applications. It may be self-powered or can be slave driven from 190-LR, 190-ACC, LRC, or LRSS conveyors. 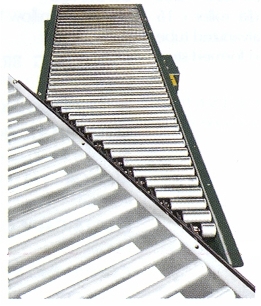 Overall Frame Widths: 16", 18", 20", 22", 24", 26", 28", 30", 34", 36", 40", 42"
The live roller spur conveyors are used in diverging or converging applications. They may be self-powered or can be slave driven from ACC or LRC conveyors.